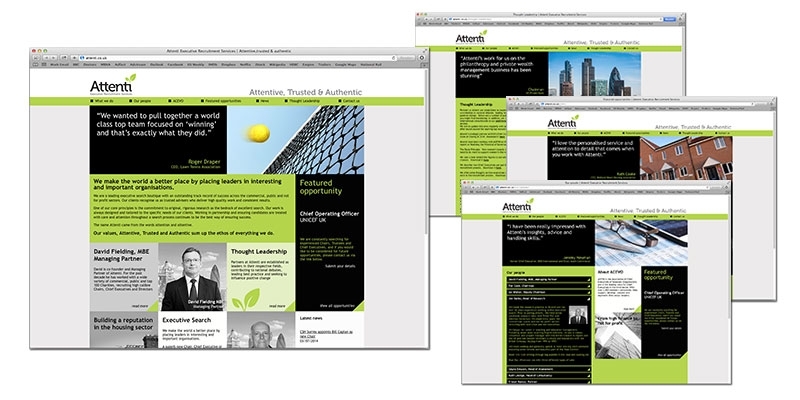 Attenti are a leading executive search boutique with an outstanding track record of success across all sectors and especially not-for-profit. WDAD worked with them for a couple of years helping their high-profile clients attract senior executives, but had inherited a recruitment website that was a little bit ‘clunky’ and looked a little bit dated. WDAD were tasked with addressing both issues. The site went live after a short development period. It uses lots of ‘boxes’ giving little snippets of information on various people, services and crucially job opportunities in lots of different places throughout the site; cleverly reinforcing the key messages throughout the site rather than the more traditional approach where these are compartmentalised on individual pages. Built on a WordPress platform it allows the clients lots on control and flexibility over the content thereby further minimising the costs.